Fiorelli based in Casa di Novi Ligure, founded in 1951, built a Normale motorcycle with a 125 cc two-stroke engine with a three-speed transmission. In 1952, they added a Sport and Grand Touring version with only aesthetic changes since the Normale version. In 1953, also built models of 175 cc in multiple versions that remain unchanged until 1954. 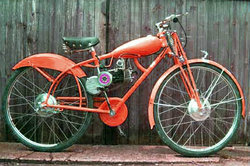 Later, the company took on the mark of motorcycle manufacturer Fiorelli and manufactured motorcycles with 49 cc engines.